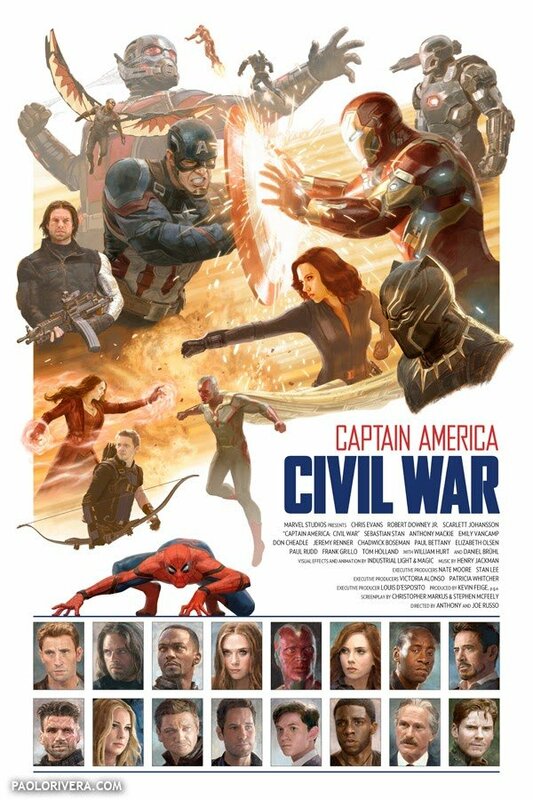 Comic book artist Paolo Rivera is known for producing amazing covers and interior artwork for Marvel Comics, but he’s also created a fair few cast and crew posters for many of the Marvel Studios movies. It’s no surprise then that he was drafted in for Captain America: Civil War, and as you can see in the gallery above, he’s put together a stunning piece of artwork. Before you start making plans about getting one of these framed for your wall though, these were made exclusively for those who worked on the movie and won’t be going on sale any time soon. That’s obviously rather disappointing, but Captain America: Civil War‘s performance at the box office certainly isn’t. Marvel’s first Phase 3 movie has already earned more than Captain America: The Winter Soldier did back in 2014 and is expected to pass the $950 million mark by the end of the weekend. That means a haul of over $1 billion is now guaranteed. Clearly grateful at the overwhelmingly positive response to the movie, Captain America: Civil War directors Joe and Anthony Russo have taken to social media today to thank fans for making the film such a huge success and were quick to drop in a tease for their next big Marvel movie, the soon to be retitled Avengers: Infinity War. Tell us, have you seen Cap’s new adventure yet? Sound off below and let us know!